First preheat the oven to 400°. 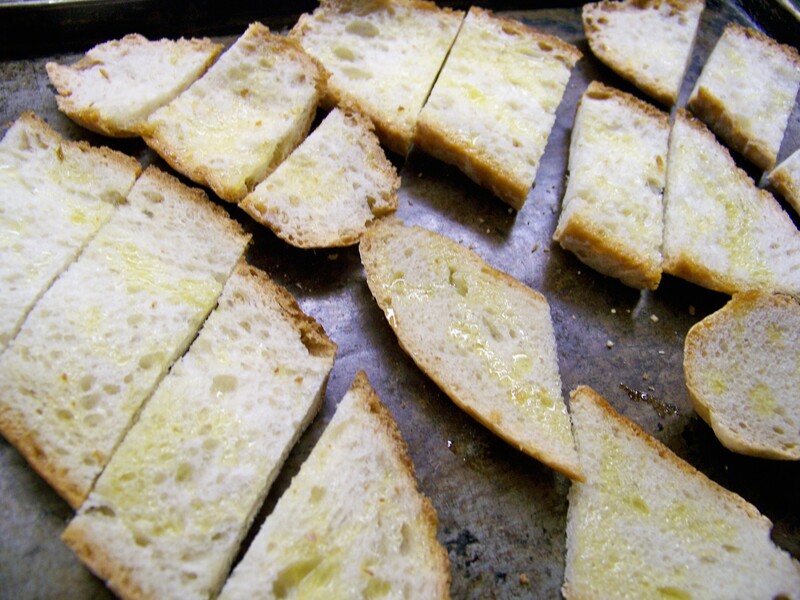 Drizzle the bread with the oil, cut it into bite size pieces and bake for about 15 minutes or until crispy and toasted. While that bakes, drain and cut up the artichokes into smaller bits. 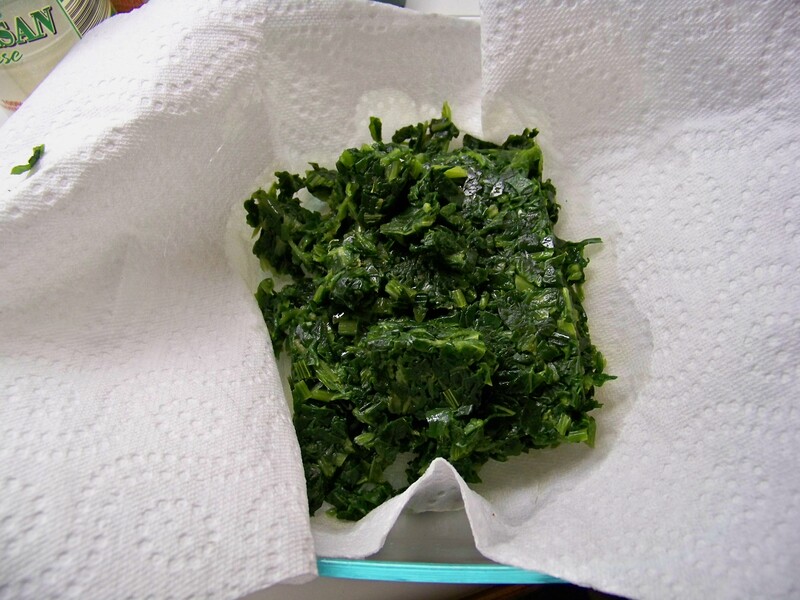 Place the thawed spinach into a cloth or a sheet of paper toweling and squeeze out as much liquid as possible into a small bowl and set it aside. Do the same with the artichokes. 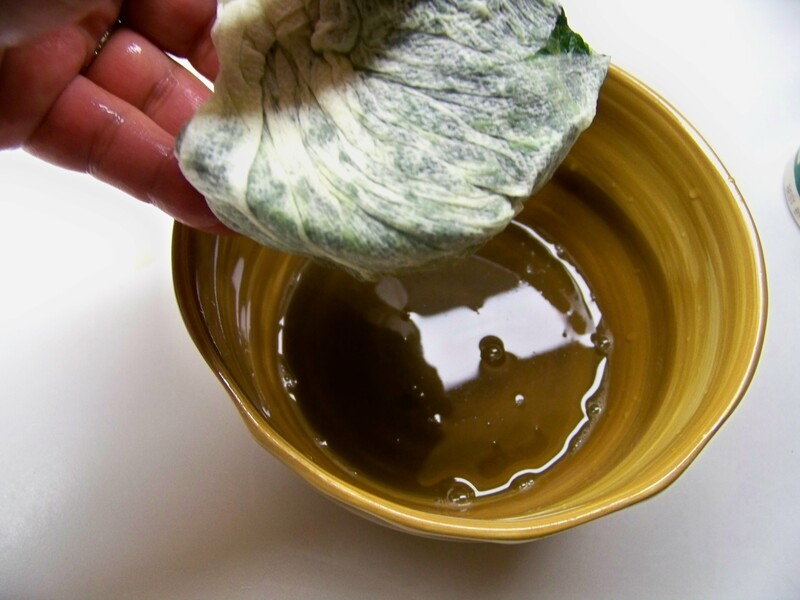 You may use the same toweling and will get out a bit more moisture even after draining. 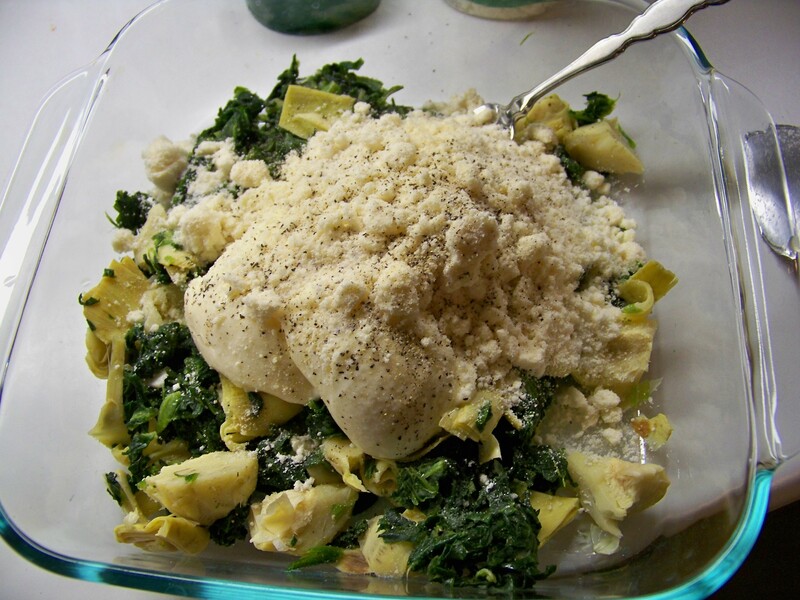 Place the vegetables into the baking pan along with the mayonnaise, Parmesan and seasonings and stir it all together. 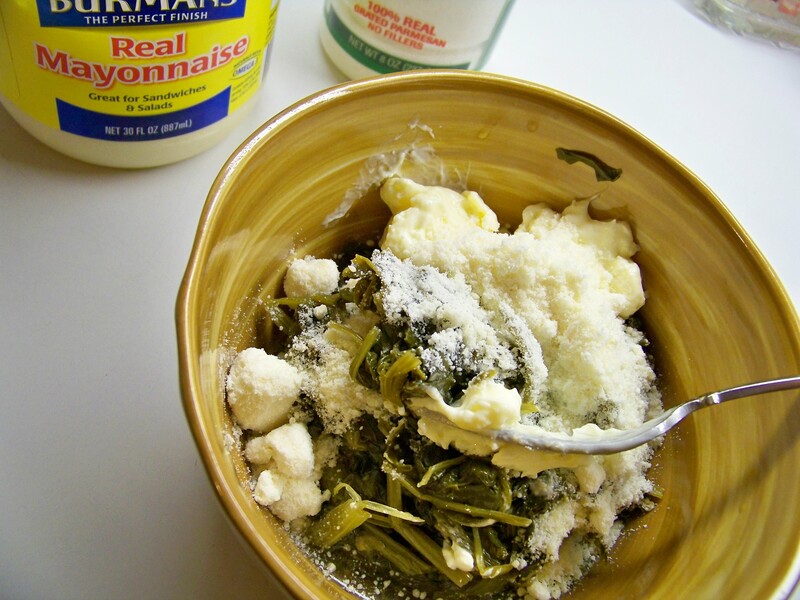 If your mixture is too dry, add a bit more mayonnaise along with a few tablespoons of the reserved liquid. 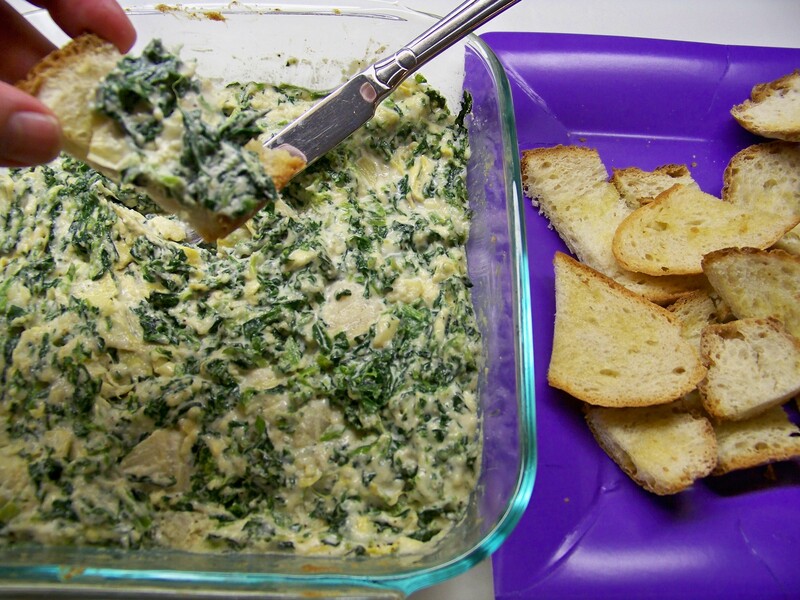 When it becomes a spreadable mixture, smooth the top over evenly, remove the bread from the oven and switch it with the spinach and artichoke dip and bake it until warmed through. It may even be a bit browned on the edges. This should take about 15 to 20 minutes. Now you’re ready for the barbecue, the pot luck supper, or the trip out to the winery’s picnic. 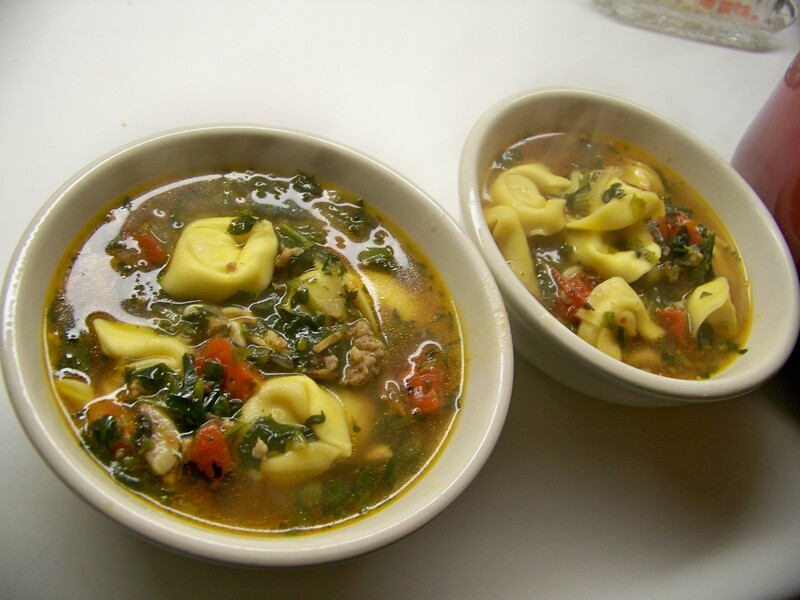 This little appetizer is hearty enough to even be lunch…and that’s just what it was for me and my daughter today. I encourage you to give this one a try. There’s no doubt, chicken is quite an economical way to serve and enjoy good flavor, concentrated protein and essential iron while giving your wallet a little relief. There are so many ways to cook chicken as well. 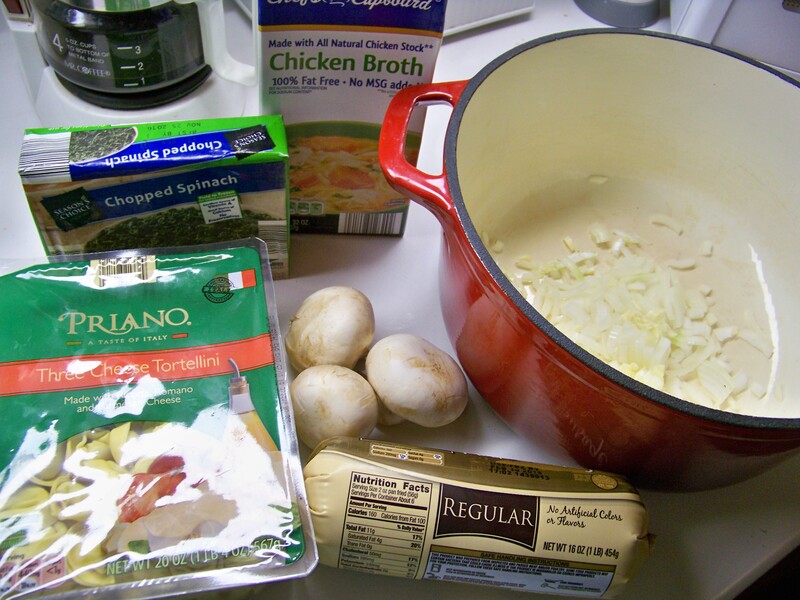 I’ve probably blogged about over three dozen recipes myself. This is one of my favorite ways because it always turns out so elegant and tasty without letting anyone know I’m a huge cheapskate. 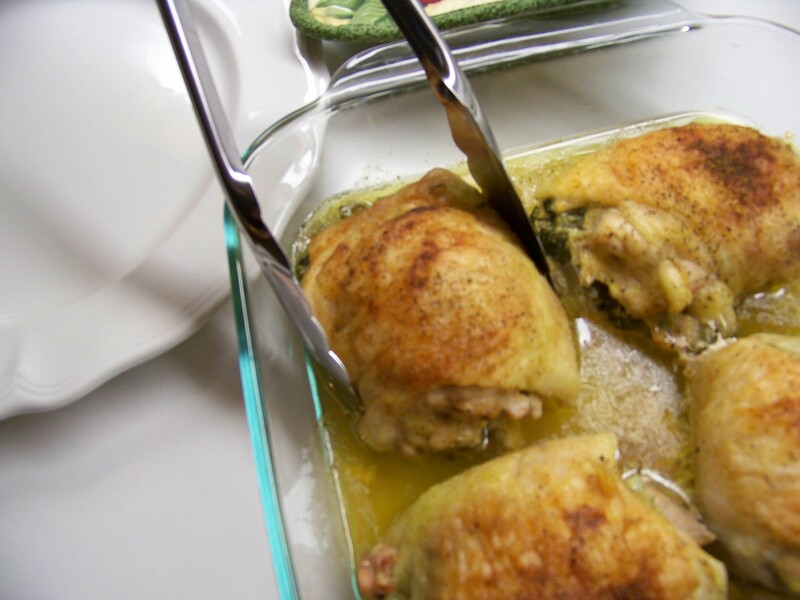 Chicken thighs are the new chicken wing. It used to be that the wings were the cheapest cut of chicken because there was no real meat on them. Then the Buffalo wing was born and wing prices went up. I feel guilty for touting the economical benefit of the thigh because it’s one of those same stories where only we cooks know that the thigh is about the tastiest meat on the bird and when it costs five bucks for four pounds of it, most of it meat unlike the wing, we know what a good deal we’re getting…well, you will when you try this dish. Preheat the oven to 375°. 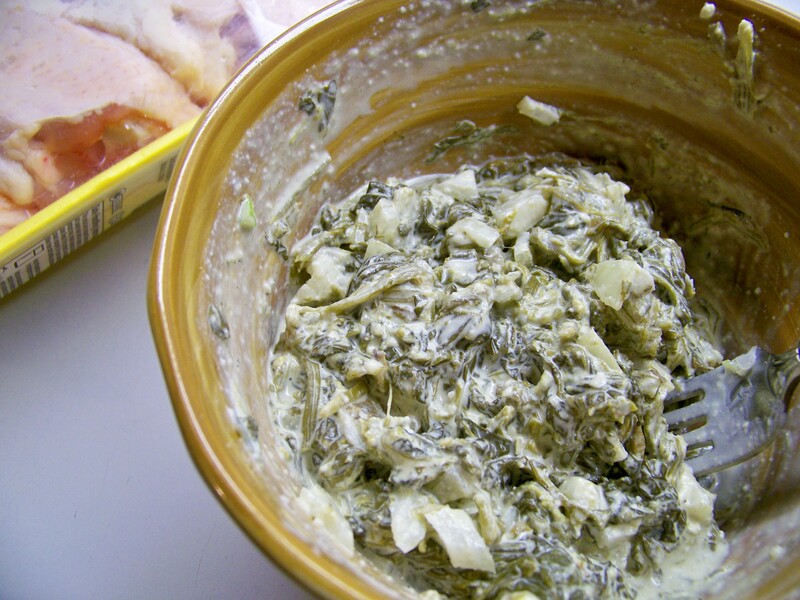 Mix the spinach, mayo, cheese, and the dash of each seasoning, stir in onion and set aside. 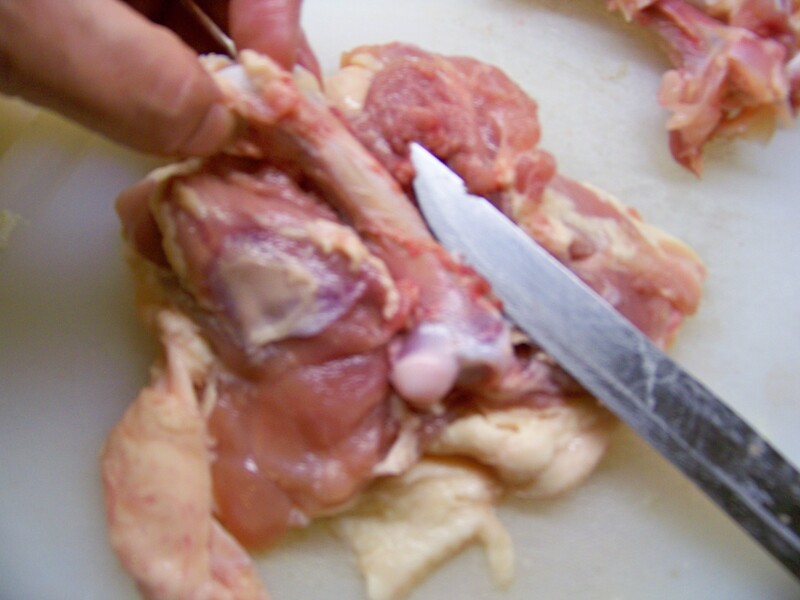 Turn the chicken thighs skin side down on a cutting board and look for a vein of fat that runs parallel to the bone. With a very sharp knife cut directly along that vein and the bone will be exposed. 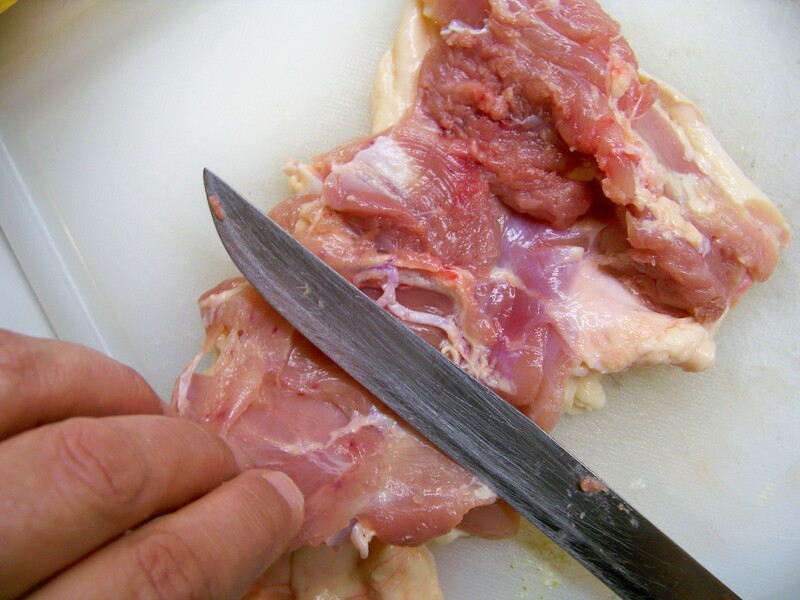 cut around and even under that bone and remove it, slicing out each end careful not to remove too much meat but all of the joint and its connective matter. 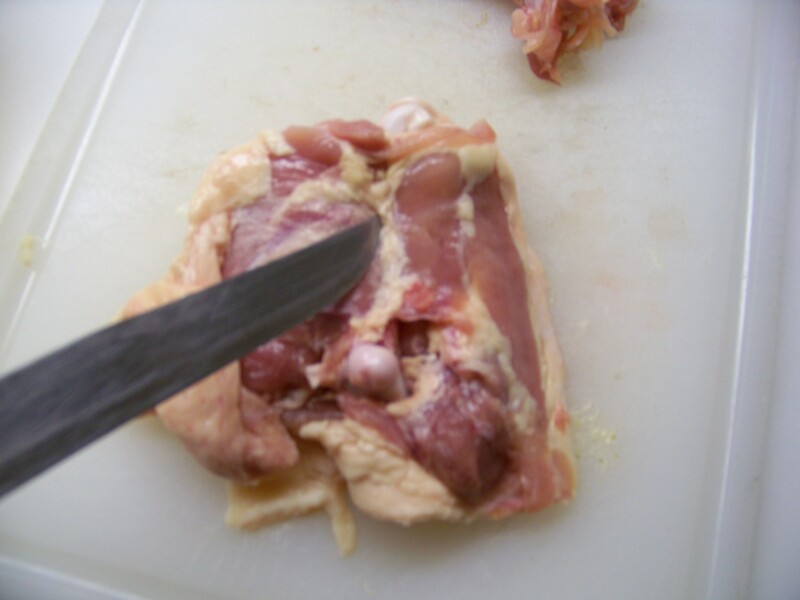 With the bone out, cut a slit in the bigger half and unfold that portion (like a brochure) making a uniformly flat piece of chicken. 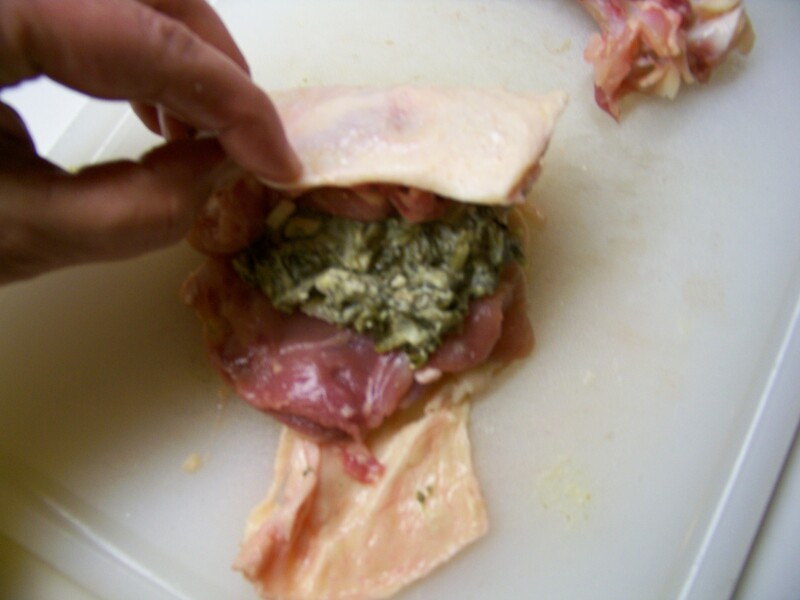 Spread an even amount of spinach mixture (about 1/3 cup) over the chicken meat and roll it up. 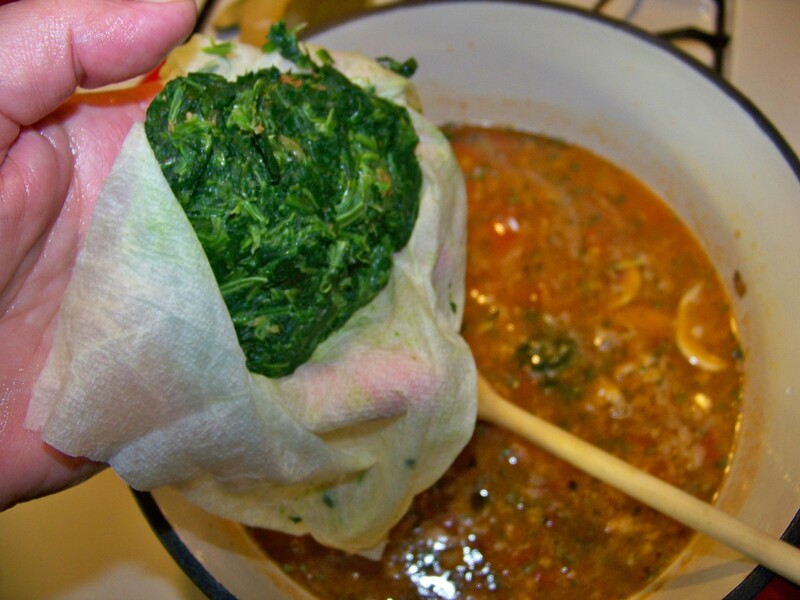 Place the roll seam side down in a 9″x 9″ casserole dish. 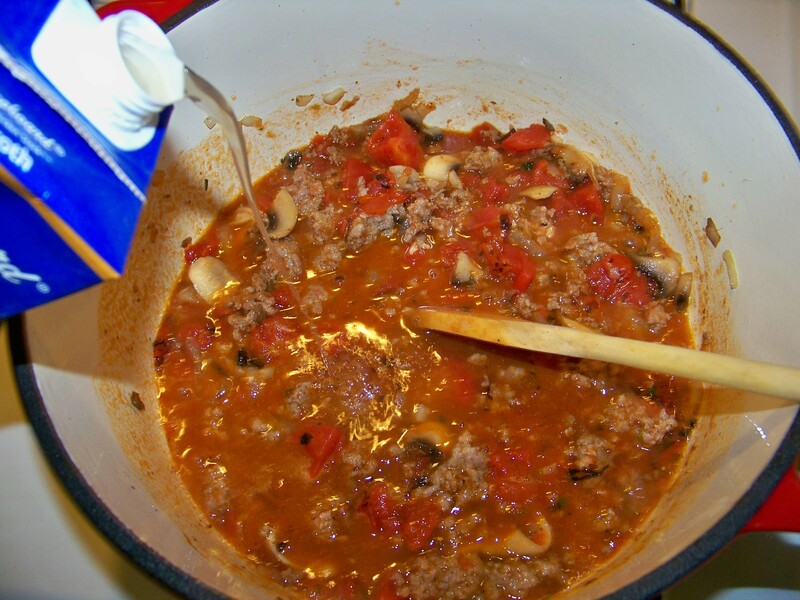 Use a larger casserole for more thighs. 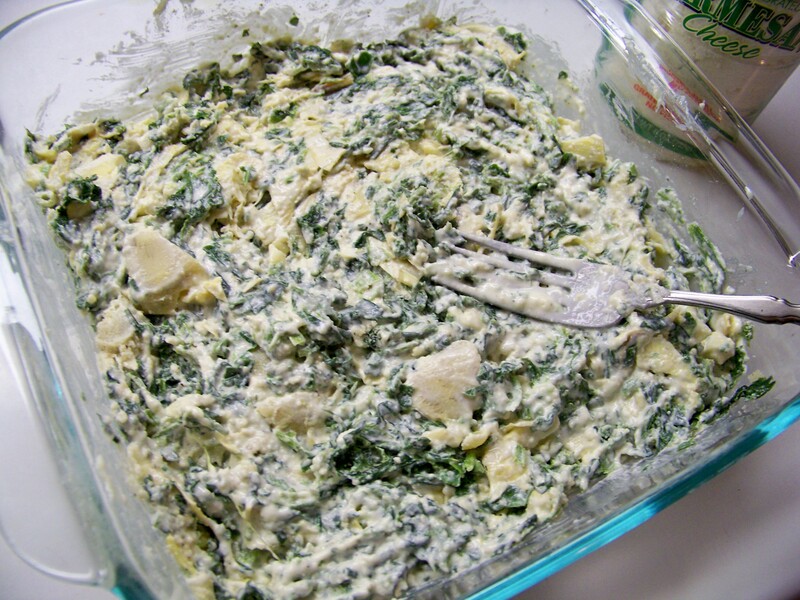 The spinach mixture should be enough filling for six or seven thighs. 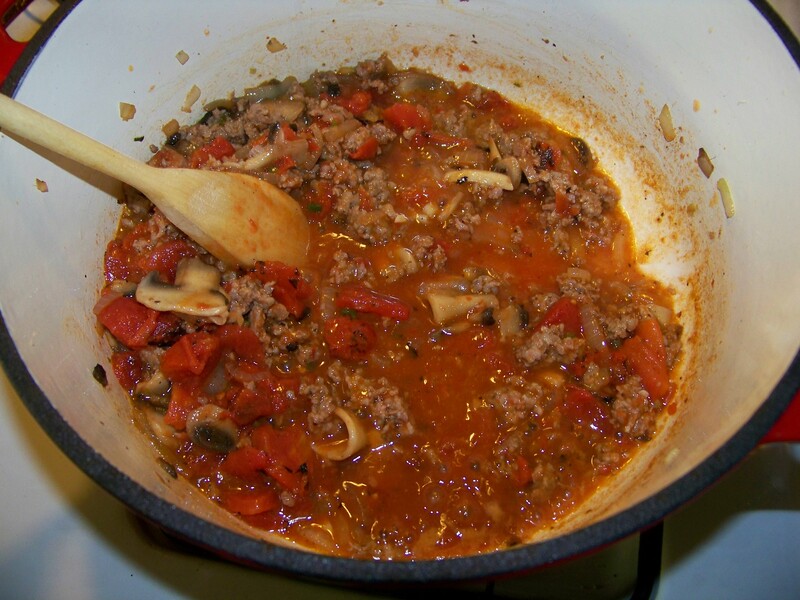 Now bake them for about 50 minutes to one hour, or until the internal temperature reaches 180°. 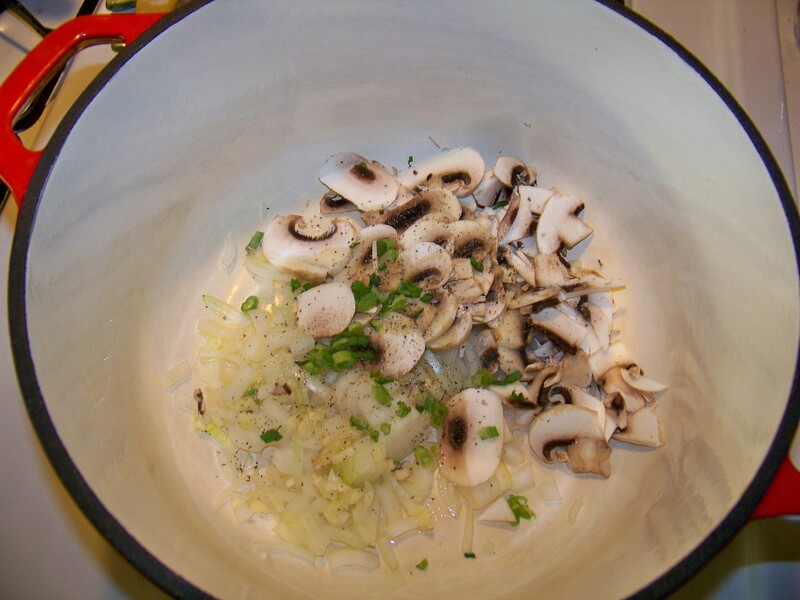 Remove to a plate and allow these to rest for about ten minutes and serve with a little salad or some rice. 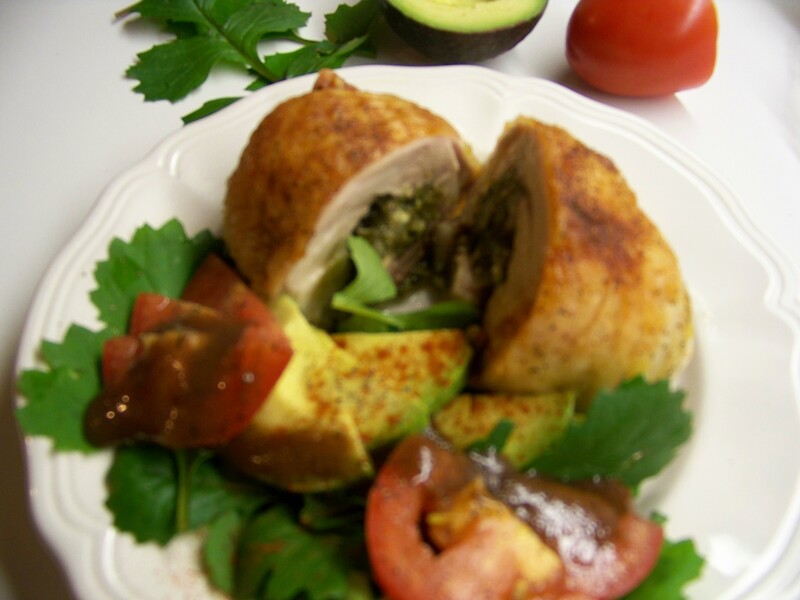 Remember there are already two vegetables inside the chicken so they will also be good all by themselves.